After the success of the first edition, organized in September 2012, in Sinaia, Romania, this year, the second edition of the International Workshop on Creative Collaboration through Supportive Technologies in Education – CCSTED 2013, as a Dissemination Seminar of the CoCreat project, has come in conjunction with a traditional conference which aims at investigating, comparing and describing the relations, encounters, intersections, confluences, mutual influences and/or parallels between the Nordic and Baltic Sea areas and the Black Sea region: the Fourth International Conference on Nordic and Baltic Studies of the Romanian Association for Baltic and Nordic Studies – “Empire-building and Region-building in the Baltic, North and Black sea areas“. The wonderful city of Constanţa, Romania (situated at the Black Sea coast), through the efforts of the colleagues from the Ovidius University of Constanţa, hosted the Conference plenary sessions and its sections, where 88 participants from 3 continents (America, Asia and Europe) presented the results of their researches. Also, the participants benefited of the opportunity to have in the middle of them, important people coming from the diplomatic missions of Nordic and Baltic countries: Her Excellency Ulla Väistö, the Ambassador of Finland, Bucharest, His Excellency Marek Szczygieł, the Ambassador of Poland, Bucharest, Mr. Herman Baskår, Counsellor / Deputy Head of Mission, Embassy of Norway, Bucharest, Mr. Mihkel Metsa, Counsellor / Deputy Head of Mission, Embassy of Estonia, Warsaw, Mr. Laurenţiu Lazăr, Honorary Consul of Norway, Constanţa. One special session was dedicated to the CCSTED Workshop, which had a specific target oriented on how to support creative collaboration through various technologies, at different levels of education. As it was already decided from the previous edition, the workshop proposed to the participants to make known the current research on computer supported collaborative learning topics, leading towards the meaning of various learning environments which can support the creative collaboration process. 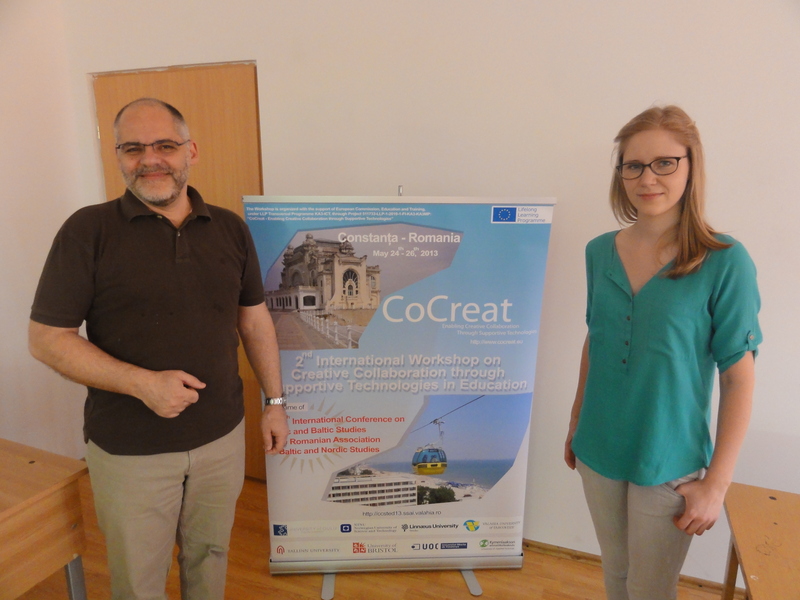 8 papers were presented at the workshop – part of them underlined the results gained in the CoCreat Project (using of mobile technologies in creative and collaborative storytelling, managing the time in computer-based creative collaboration, experiencing the students’ challenges in virtual collaborative courses). But also, the other papers came with a real value on the Workshop topics, enriching the context and coming as a real opportunity for the final discussions (increasing the learning group creativity within computer supported collaborative learning, considering human memory simulation and e-learning technology for brain-based learning education, experiencing different software tools for class discussions, involving robotics for enabling the classroom creativity, using the inquiry based Science Education environment for raising the students’ creativity). At the end of the Workshop, fruitful discussions were held, marking important feed-backs from the participants, with a great potential for the following period in terms of collaboration and cooperation. The participants (including the members of the diplomatic missions) were rewarded with promotional CoCreat project materials, including t-shirts and special mugs! Here are some conclusions concerning the Workshop, made by an “external” critical participant, Prof. Pompiliu Alexandru (Valahia University Târgovişte): “I was extremely impressed that this Workshop came exactly to solve some major problems that I am facing for a while related to the educational efficiency of the technological supports. Having a humanistic training, I often consider scientific fields as terra incognita – and today we see that in the very core of Sciences, various specializations and disciplines are self-sustaining in such a way that creates some fractures of understanding between scientists. But the Workshop was a real revelation, treating in intelligible way problems related to innovation and creativity. The Workshop was presented in mass-media, having a clear impact at the dissemination level, also for the interested colleagues who could not attend it. As main organizers of the Workshop, the CoCreat team from Valahia University Targoviste would like to thank for the whole support, to the participants, to the steering committee of the CoCreat project, but also to the colleagues from Ovidius University of Constanţa and Conference organizers, mentioning that all the participants expressed their willingness to participate at the third edition, in 2014. This entry was posted in Conference, Creative Collaboration, Event, Research, Workshop and tagged creative collaboration, event. Bookmark the permalink.